Carcinoid cancer is also referred as a cancer in ‘slow motion’. This is by and large a growth of the neuroendocrine system, a complex of glands that secretes substances and conveys produced hormones into various organs of the body. Such secretion is proved to have adversative effects in the normal functioning of systems and other organs. 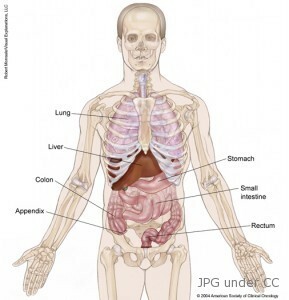 Carcinoid cancer areas are shown in the diagram on the right. This is an indolent type of cancer that brings in the formation of cells in the inside layer of the gastrointestinal tract. Due to its slow growing characteristic, warning indications of Carcinoid would most often take several years before manifesting as a malignant type of cancer. According to research, an average of 85% proved that the most common site of Carcinoid is found in the appendix, occurring in the lower right part of the stomach. It is likewise found in the foregut, a part of the embryonic intestine with 35 % probability and in the mid gut found in the small intestine. Adult women over 60 years of age are those mostly affected by Cancer of the Carcinoid. Gastrointestinal Carcinoid Tumor – This is a kind of disease wherein cancerous cells are developed and expanded into the digestive or gastrointestinal system. The neuroendocrine also known as hormone-making cells are deemed to be responsible in managing and controlling the process of digestion. The moment these cells go through changes that results in uncontrollable growth, Carcinoid tumor in the gastrointestinal tract is developed. This kind of growth is known to be apparent in the lung area. However, most cases and studies proved that the small intestine where digestion and absorption normally takes place is the common site of this kind of disease. Lung Carcinoid Tumor – This is also known as neuroendocrine tumor, a lump that grows in the neuroendocrine cells. Lung Carcinoid Tumor has four types. Firstly, the small cell lung cancer or SCLC considered as a grave type of cancer known for its ability to spread rapidly in the affected system as well as in other body parts. Secondly, the large cell neuroendocrine carcinoma known to be an uncommon kind of cancer. Apart from its size, the prognosis for this cancer is parallel with that of SCLC. Lastly, the carcinoid tumor which is divided into two kinds: the typical and atypical carcinoids. The former is a kind of tumor that develops in a slow phase where cells infrequently multiplies and extends into the lung region. On the other hand, atypical carcinoids is the exact opposite of the typical where it is known to proliferate faster due to its numbers of cells and the possibilities of spreading in other organs and systems of the body. The swelling of peripheral body parts such as the head, hands, feet and face. Up to this date, there is no known cause of Carcinoid cancer. Nevertheless, there is one genetic disorder that is being scrupulously studied, the Multiple Endocrine Neoplasia 1 or MEN1 is believed to be responsible in augmenting threats for neuroendocrine growth. The risk factors involved in having this kind of illness is on the aspect that the cancer or tumor’s indications are somewhat complicated to be seen as it is known for its slow phase characteristic. Carcinoid cancer can be treated based on the patient’s overall health status and the site and extent of the tumor. The first line of medication for this kind of cancer is surgery. However, treatments are of the case to case basis. So, how will one know if surgery is the right treatment to cure Carcinoid growth? If the cancer cells do not spread in other regions of the body, then it can be treated through surgery. The patient will be cured without further treatments once the lump is removed from the specific body region. On the other hand, medical professionals suggest chemotherapy specifically on cases where cancer cells have spread all throughout the body. Chemotherapy is known to combat cancerous cells and reduce the size of the tumor. If the tumor has spread in the bone area, sessions of radiotherapy may be given as a procedure of wiping out cancer cells in a high-energized medical way. For biological treatment, an injection under the skin called ‘interferon’ is normally given to patients who have the symptoms of Carcinoid tumor.